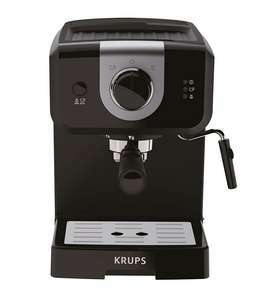 I had a Krups espresso machine similar to this until very recently (was …I had a Krups espresso machine similar to this until very recently (was tempted by the sage barista express deal on here!). Lasted pretty well over 3 years, no issues at all with the the pump and internals but the portafilter chrome plating lifted away and it started corroding (krups replaced it under warranty but the second is now doing the same). The coffee from the sage is noticeably better as is the milk but as a relatively low cost entry into espresso this is probably a reasonable starting point. I'd love a sage machine but I don't know if I like coffee enough to …I'd love a sage machine but I don't know if I like coffee enough to justify the spend!